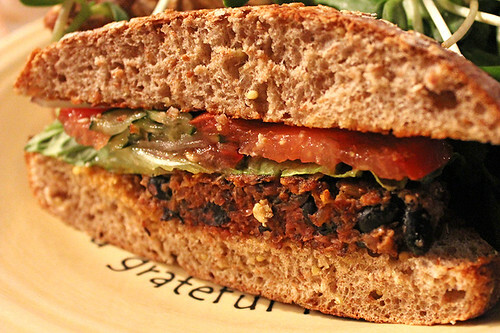 I was really excited to try the veggie burger at Café Gratitude, because numerous people had recommended this restaurant to me as one of the best vegan spots in L.A.! 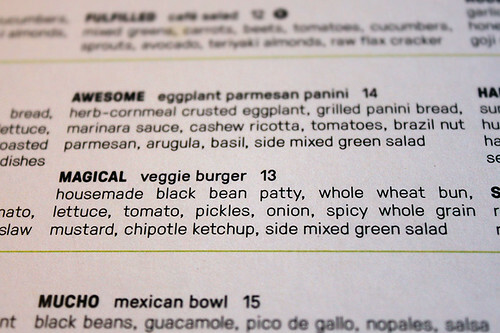 The veggie burger is described as “magical” on the menu, which made me smile (all of the menu items get their own creative adjective). The burger arrived on a hearty, whole grain bun. This bread was pretty great quality bread, but it was far too large and thick for the size of the patty and toppings! Unfortunately, all I could taste in the first few bites (in most bites, actually) was bread. And it was so filling I could not eat it all, and resorted to eating the second half of my burger as an open-faced sandwich, removing the top half of the bun. The patty itself was much better – a tasty blend of beans and spices. I wish it had been larger, as it seemed surprisingly small to be paired with such an oversized bun! It was also a bit mushy, and I thought it would have benefited from a crispier outside or some other texture mixed in. The toppings were pretty simple: lettuce, tomato, raw red onion, and pickled cucumbers. The pickles were nice, but there weren’t many of them, so I was only able to taste them in a couple bites. I think the mustard sauce and spicy chipotle ketchup just got absorbed into the mushy patty and bready bun, as I only tasted a hint of them. And again, like the patty, there were not enough toppings to match the oversized bun! 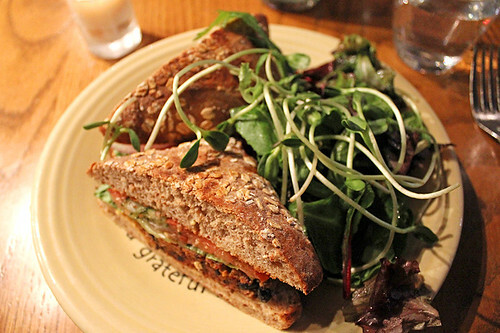 Overall, I was a bit underwhelmed with Café Gratitude’s veggie burger (especially for $13…). It was a decent burger, definitely higher quality than the average veggie burger from a non-vegan restaurant, but I think it was too over-hyped for me. I would love to hear what others liked about it, since I feel like I must be missing something, or maybe my taste is just very different (or I’ve been spoiled by some seriously stellar veggie burgers?). 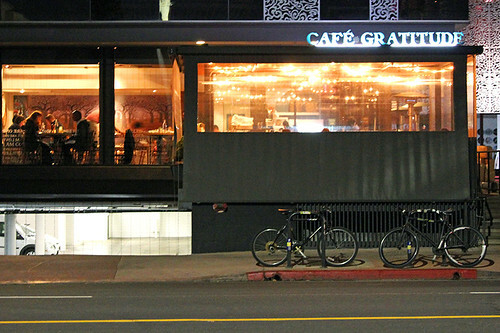 But my omnivorous boyfriend, cheerfully game for another vegan restaurant adventure with me, absolutely loved the “Humble” Indian Curry Bowl that he ordered – so Café Gratitude must be doing something right to win over an avid-meat-eater like that! 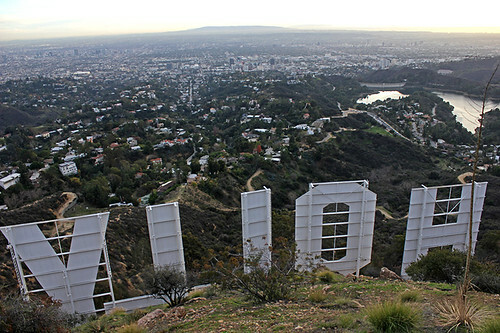 I wish we’d have more time in Los Angeles (2 weeks is not long enough!) to come back so I could try some other dishes on the menu, as I have noticed that sometimes the best veggie burgers are not found in all-vegan restaurants, and sometimes the best all-vegan restaurants do a lot better on other menu items than the veggie burger. Major disappointment! Hate when vegan places phone it in like that.